Several years ago, it would have been rather hard to imagine such an excellent peripheral would come from a company like G.Skill. Nonetheless, the introduction of the KM780 keyboard proved otherwise. There’s no doubt that it’s one of the greatest, most feature-packed keyboards ever developed. A few tweaks could, however, be implemented to polish the design. The KM780, just like G.Skill’s SR910 headset and MX780 mouse adopt a “gamer-friendly”, eye-catching design. The keyboard’s bezel doesn’t run all through the edges. Instead, it employs an exposed metal bar displaced from the board’s outer rim. This bears a lot of resemblance to Logitech G410’s superfluous cutout. The drawback with such an extravagant or game-y design is that some people might shy off from using it for in the office. The board’s brushed metal backplate gives it a futuristic and sleek look. The wrist rest is reasonably comfortable and lightly textured. The media keys — positioned at the top right — are similar to those on the Logitech G910: thick little rectangles for Mute, Fast Forward, Play/Pause, Rewind, and Stop, not forgetting the conspicuous volume roller. Another incredible feature present in the KM780 is the digital display for volume. It’s divided into 12 independently lit LED columns. Below this beautiful feature are the indicators for Caps/Num/Scroll Lock. Other notable high-end features include a USB 2.0 port, keycap removal tool, sliding piece of plastic on the metal bar for holding the mouse as well as preventing tangles, and an extra bunch of contoured red keycaps for gaming-centric keys as well as WASD. One issue with the Cherry RGB design, however, is that placement of the LEDs near each key’s top — which is necessary since the Cherry switch incorporates a ‘stem’ in each key’s center— results in stronger lighting at the top compared to the bottom. This makes certain keys to have uneven lighting. For instance, the shift key’s arrow is barely lit, so are the entire numpad’s secondary functions, as well as the actual numbers located on the top row. 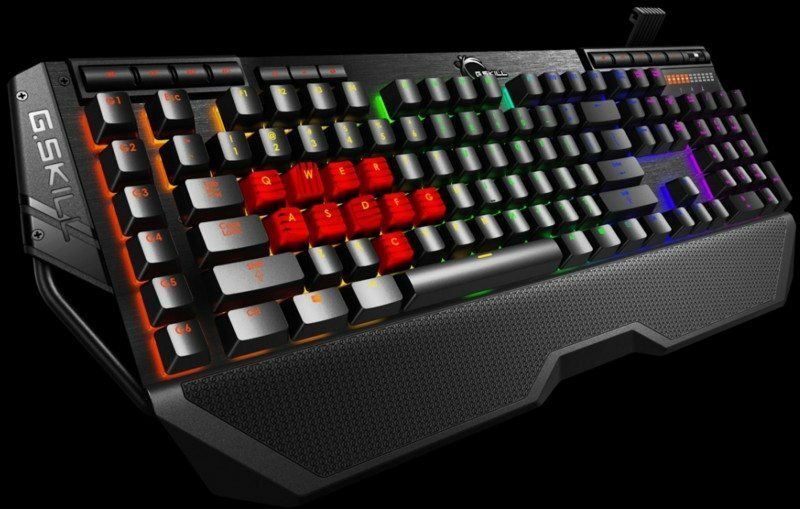 The keyboard is also characterized by some light leakage, similar to Corsair’s boards. This can also be attributed to its Cherry RGB design that uses clear plastic throughout the entire outer edge. This means some light spills back to the user, a notable distraction in dark environments. The upside, however, is that the keyboard incorporates actual Cherry switches. It’s vital to note that G.Skill — as well as Corsair — is among the few manufacturers that utilize genuine Cherry MX switches rather than knockoffs or custom-built designs. That means the user is guaranteed of an exceptional switch, be it Red, Brown, Black, or Blue. It’s better if the user’s favorite falls among these because they’re the defaults. It’s difficult to go wrong with the Cherry switches in terms of quality, consistency, and durability. When it comes to software, the keyboard’s setup largely resembles Corsair’s CUE, which is pretty complicated, powerful, and a bit confusing. While it isn’t too hard to set a single background color, coming up with a decent effect requires a significant amount of clicks compared to Logitech, or Razer’s software. The good news, however, is that it’s possible to create extremely detailed and precise effects. The drawback, on the other hand, is that it takes a bit of work to learn G.Skill’s layer system and set up everything according to the user’s preferences. The G.Skill KM780 gaming keyboard is without a doubt one of the best RGB-enabled keyboards available. A worthy competitor is the K70 due to its Cherry switches. Corsair also boasts of a better software and less conspicuous design. Nevertheless, G.Skill takes a few of the K70’s greatest attributes, combines them with a few of Logitech’s exceptional designs, and packs the KM780 with some of its own outstanding features. 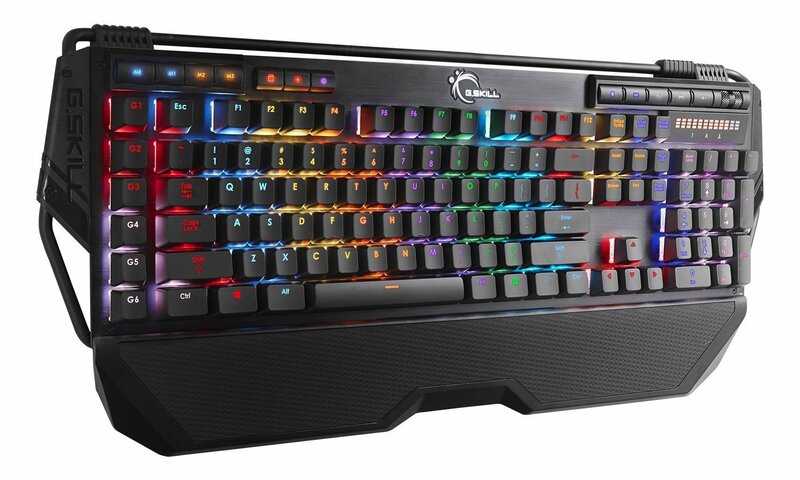 Overall, it’s a versatile keyboard that puts G.Skill on the map as far as elite keyboards are concerned. Check out keyboard reviews azspecialoffers.net for similar remarkable reviews and more.